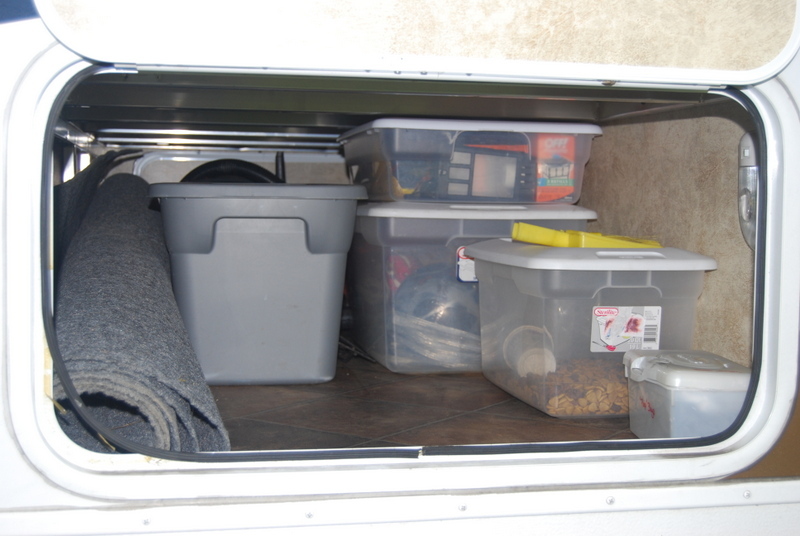 The amount of storage you have in your camper will vary a great deal depending on the brand and model you have. But whether you’re camping on weekends in a pop-up or living full-time in a huge fifth wheel, making the most of your cupboard space and keeping things organized is key for staying a happy camper. Compared to our former pop-up camper, our travel trailer really has a lot of cupboard space. But making the best use of that space can be a bit challenging due to the often odd-sized cupboards: some are not very deep, while others are very deep making it hard to reach things far in the back. 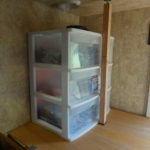 Over on our Camper Organization Pinterest page I am always pinning new ideas to help utilize that space better–and some of the ideas we will be trying out in the near future! 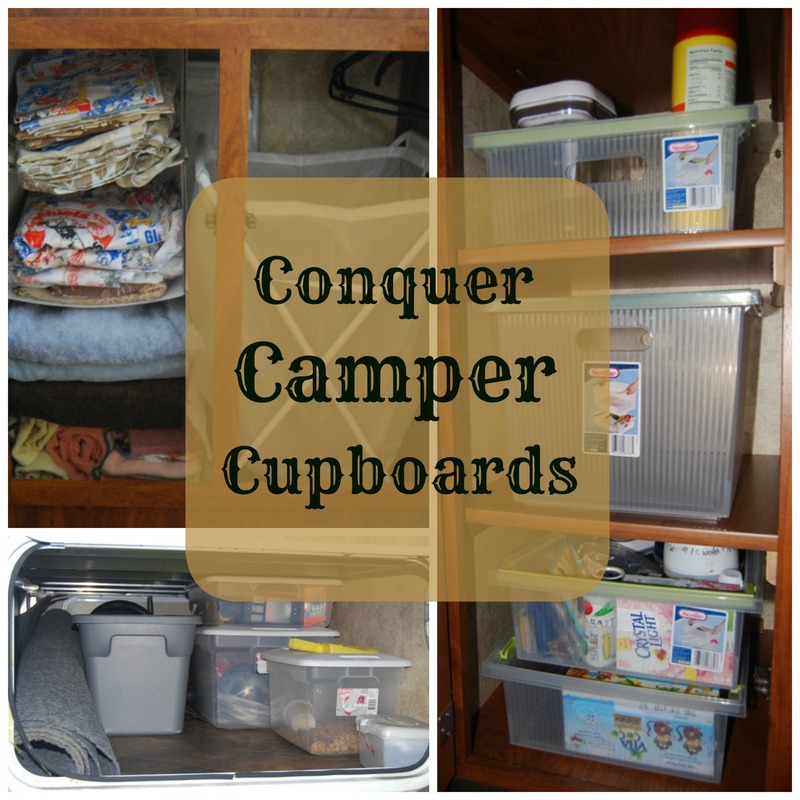 But here are a few ways we are already conquering camper cupboards. 1. 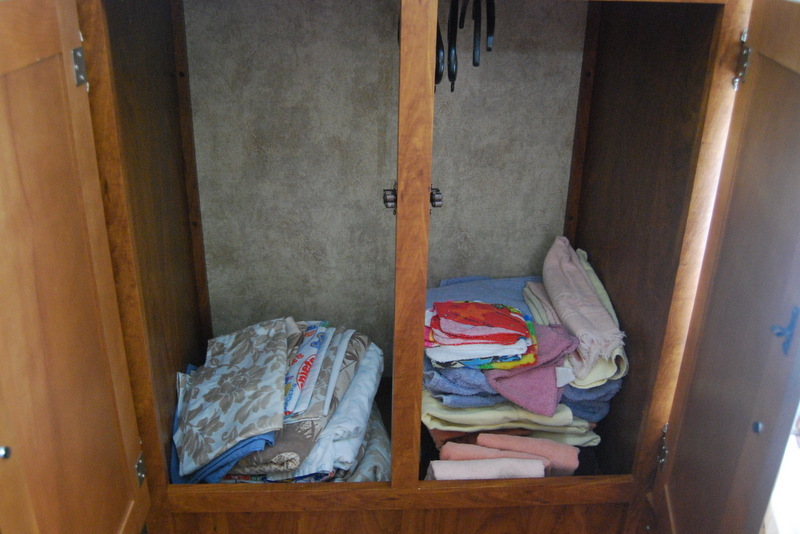 Back in the bunk area of our camper we have a large wardrobe cupboard. 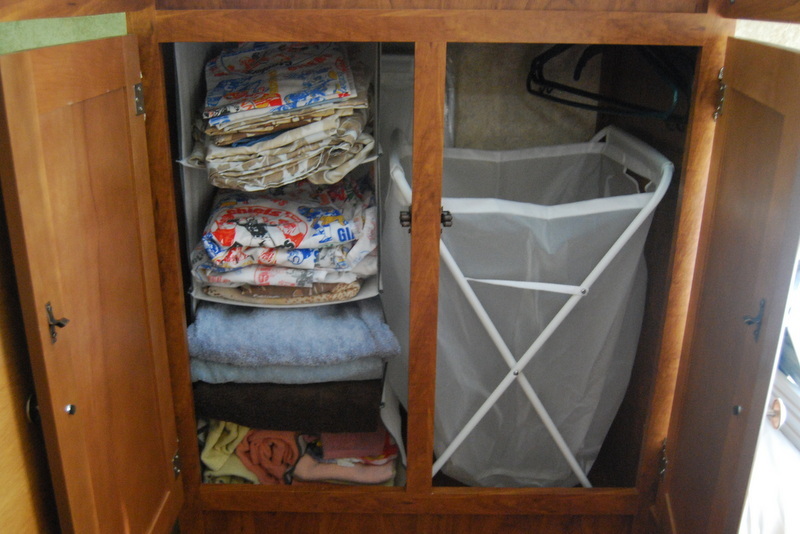 When we first bought the camper, we just stacked our blankets, linens, and towels in this cupboard, but we were wasting a lot of space in the area above those piles. The wardrobe has a rod across the top, which got me thinking about what I could hang from it to increase our storage space. 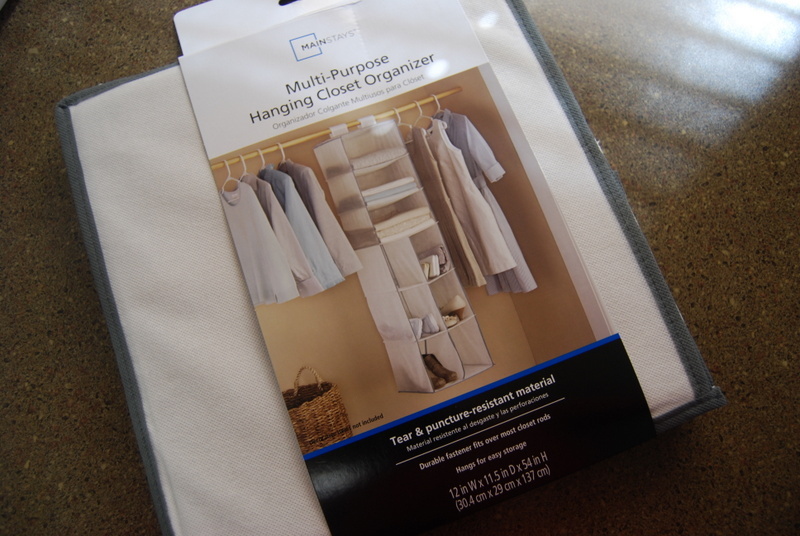 We had one of those old hanging closet organizers so I gave it a whirl. It was a perfect fit! I could organize towels and linens, but there was still plenty of room left on the other side of the wardrobe to put a laundry hamper. It looked like it was going to be the perfect solution–until we took the camper on the highway and the old wire hooks couldn’t handle the swaying motion and ripped away from the rod. Bummer. But then I discovered that newer versions of these hanging organizers velcro around the closet rod. Seemed like it was worth giving the idea another go, so I found one at Walmart, although you can pick them up at other places like Bed, Bath, & Beyond, Target, and Amazon. It is obviously too long for the cupboard, so I could either leave it as is or cut off the excess. For now I decided to leave the extra on in case I decide to use it elsewhere in the future. 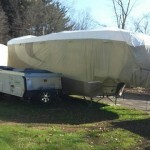 It attached to the rod very easily, and then it was just a matter of filling those spaces up with the linens and towels. 2. Another area where we have found a good organization system is the camper pantry. At Walmart I found two sizes of Sterilite bins that fit perfectly in the cupboard and can stack if needed, as demonstrated on the bottom shelf. This system has really helped keep stuff from rolling all around, and it makes it so easy to reach everything since all I have to do is slide out the bin. So much more ideal than leaning over to reach far in the back for a canned good. 3. The underneath compartments of our camper are mammoth. I think Jarrett and I could literally slide in side by side with room to spare. So while this is fantastic for fitting all the outside equipment, toys, and dog gear, things were becoming a jumbled mess as they shifted while traveling and we couldn’t easily find things. 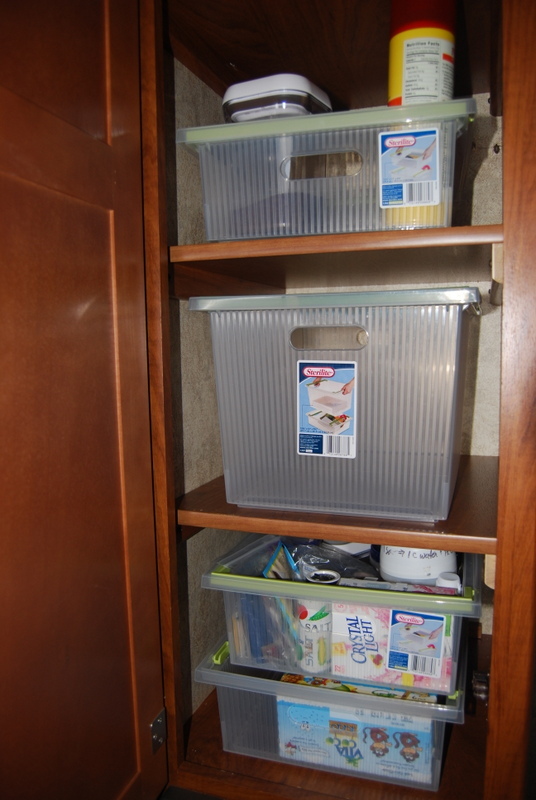 So we discovered that some of the storage bins we already had on hand stacked really well in the compartment. Note the rolled outdoor carpet: We are working on a new way to store this in a tube on the back camper bumper, so stayed tuned for a future post. Additionally, see the baby wipes container in the right hand corner? 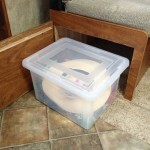 At some point I need to share with you the many, many uses in the camper for these versatile containers! Bottom line: Never throw them out! We are planning to try out some additional organizing ideas in the coming winter months in hopes they will streamline things even more for when we hit the road again in the spring. 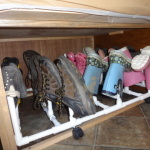 So check back often for more updates, and be sure to follow our Pinterest pages where we share more camper organization tips. Hi Betsy! Thanks for stopping by and reading! 🙂 We won’t be traveling nearly as far as we did last year, but we’ll still be doing a lot of camping this summer. Our travels will include: the Outer Banks of N.C., two loops around different parts of the state of Pennsylvania, and a fall trip to Assateague in Maryland. That should keep us busy for now. 🙂 Are you planning any trips this year? Happy camping!